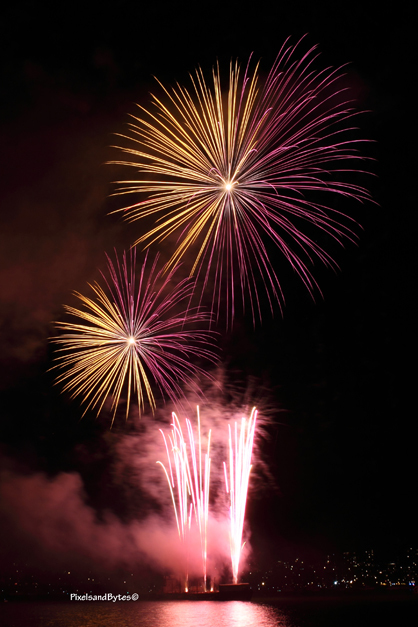 Even with today’s advances in camera technology, taking good photos of fireworks display can still be a challenge. However, I find that the reward is well worth the extra effort needed to take these spectacular photos. Fireworks are unique, with no two bursts being identical. Also, it is difficult to exactly predict how the still image will finally turn out, so viewing your shots later often results in pleasant surprises. So what does it take to get good fireworks photos? Photographers have their own techniques but the basics remain the same. I’d like to share some of the basics and perhaps you can pick up a thing or two for your next shoot. The following tips assume that you’re using an SLR camera. What do you need for the shoot? Tripod: Stability is the key to good fireworks photos. Use a tripod that will support the weight of your camera, otherwise it might drift and ruin your shots. Cable release or remote: Using one of these not only gives you more stability, it also gives you better control of your shots; increasing the chances that you’ll get the proper timing of your exposures. What shooting mode to use? Bulb: The best mode to use if it is available on your camera. Bulb mode allows you to manually control when the shutter opens and when it closes. Manual: This mode allows you to set the shutter speed and aperture independently from each other. ISO: Keep the ISO low to avoid digital noise. ISO denotes how sensitive the sensor or film is to light. Keep in mind that low ISO values have to be compensated with longer shutter speeds or larger aperture. I typically use ISO 100 when shooting fireworks. Aperture: I’ve had the best results using aperture settings between f/8.0 and f/10.0. Remember that smaller aperture settings (larger numbers) give you a greater depth of field, keeping most of the display in focus. Shutter speed: In Bulb mode, you will have to time it manually. On the average, I keep the shutter open between 2 to 5 seconds depending on how bright the burst is. In Manual mode, I normally use 2 to 3 second shutter speed. Since the shutter speed is dialed-in on Manual mode, using a shutter speed longer than 3 seconds limits your chances of getting a good shot. Get to the site early, preferably with some daylight left. This will allow you to get the proper focal range on the display using landmarks. Try to position yourself upwind since the smoke can hinder your shots later in the program. When using Bulb mode, shorten the time the shutter is kept open to compensate for brighter fireworks. Keep the shutter open longer when the display is not as bright. Take lots of shots. Cameras store the shooting information along with the photos so even if a shot goes bad, you can study the information and see what went wrong. The techniques outlined above are good starting points to get good fireworks photos. Try to experiment with minor adjustments to the settings and see what works well for you.